My command is presently holding a competition between divisions over the best decorated shop for the holidays. As of right now, my shop is leading the pack by a long shot, right now I have about 200' of my own light strings up, including the ever-popular "Jingle Bells, Shotgun Shells " light set (the bulbs are inside unused shotgun shell casings), stockings (including a pink one for my immediate supervisor, EM1 Roy), a small tree, and yes - model trains. 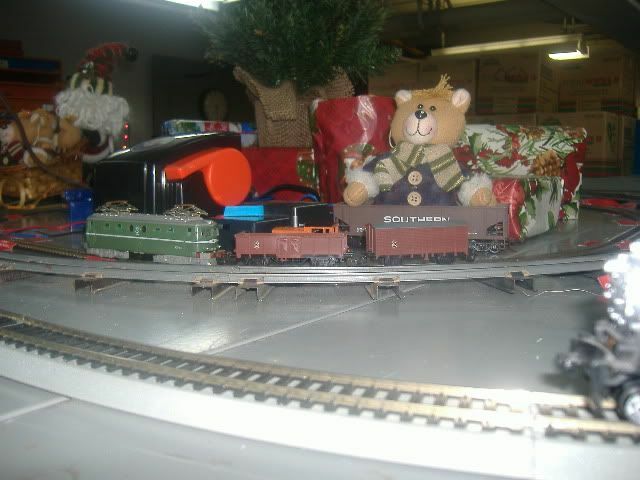 Right now I have an HO scale loop setup and a S-scale loop setup on top of the lockers in the shop (the lockers stand about 4' tall). I am planning on setting up a TT scale loop tomorrow, and am presently planning out which would be the best to bring: US prototype, or German. Does anyone else have anything similar going on at work? 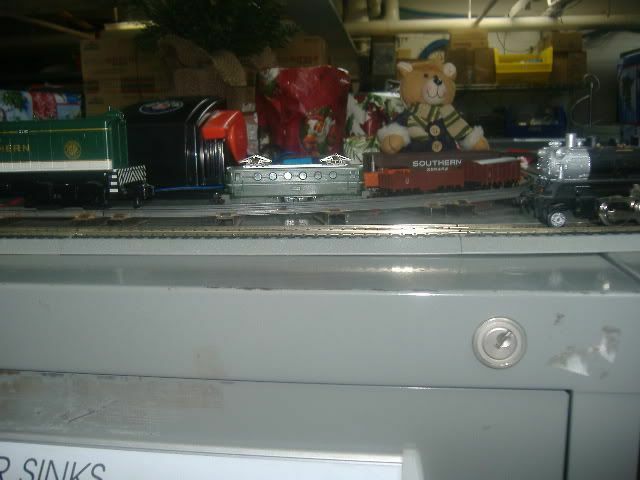 Once I can get permission from base security, I will get photos of my handiwork, trains included. Nothing similar. I would mix the prototypes. 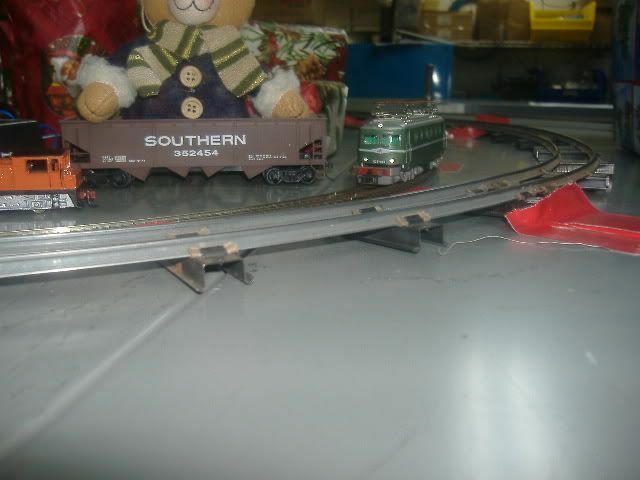 Both the HO and S set up right now are Southern Railways, the HO is a Southern 2-6-0 steamer, and the American Flyer is a Southern Railway Alco S-2. I am thinking of perhaps an electric, but my best operating TT electric engine is lettered for the CCCP, I am not sure how well that would play out on a Navy base. 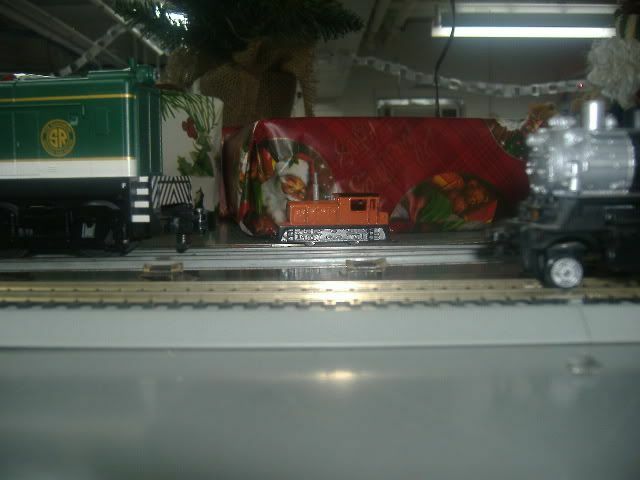 Well, the trains in the office have been a big hit, and one of the Chiefs (E-7) in my command has been spending a lot of time in the shop, and has been asking a lot of questions about TT scale. 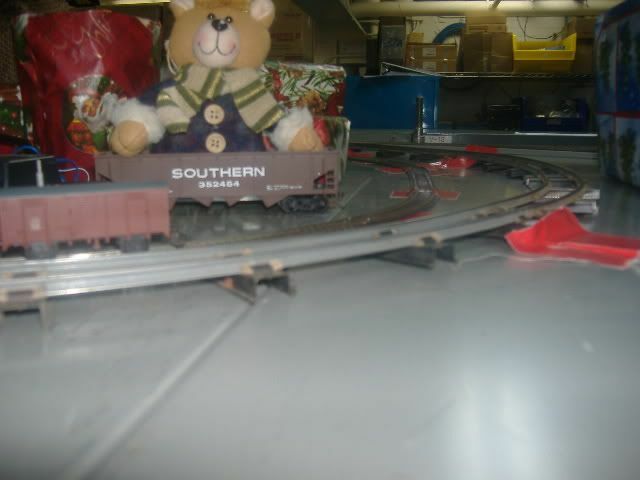 He has some Lionel trains for his children and wants to get into doing scale modeling. Today's train was a Tri-Ang 4-6-2 "Merchant Navy" class locomotive. Too bad that it was today that I found that the idler gear on the loco is shot, it looked like someone had mashed something into the gear at one time, and the bent gear teeth eventually ate away at each other, fortunately I have spares for this engine. Even sitting there, it got a lot of positive comments. As soon as I get clearance from base security, photos will be taken. and straight on to ttnut! Right now my PVM 25T Plymouth is singing it's song right now. 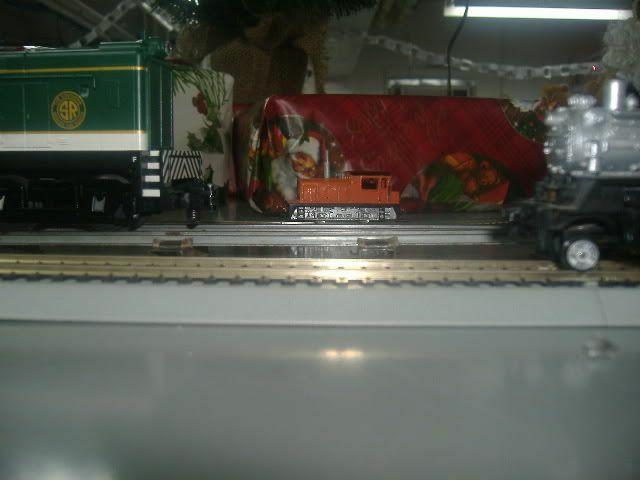 I have gotten a lot of comments on how small it is, especially in contrast to my American Flyer S-2 diesel. Photos should be up by the end of this week. 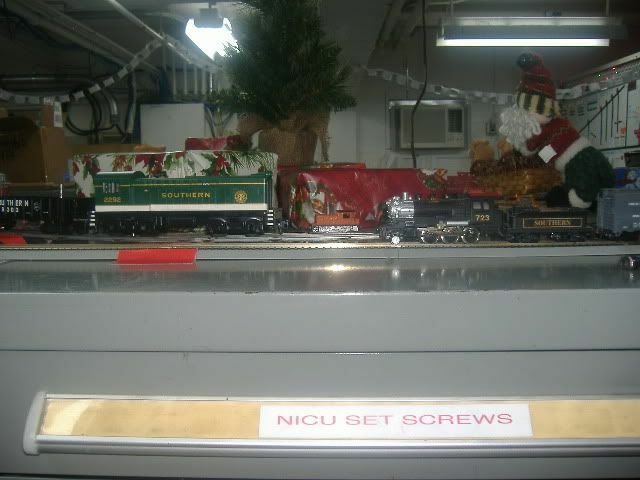 Here are some photos of the layout at work. 5 gauges on display: G (out in the main bay area), HO, S, TT (obviously), and the off-TT that those bargain sets use. Here are some photos from today. My shop won the decorating contest, by the way.